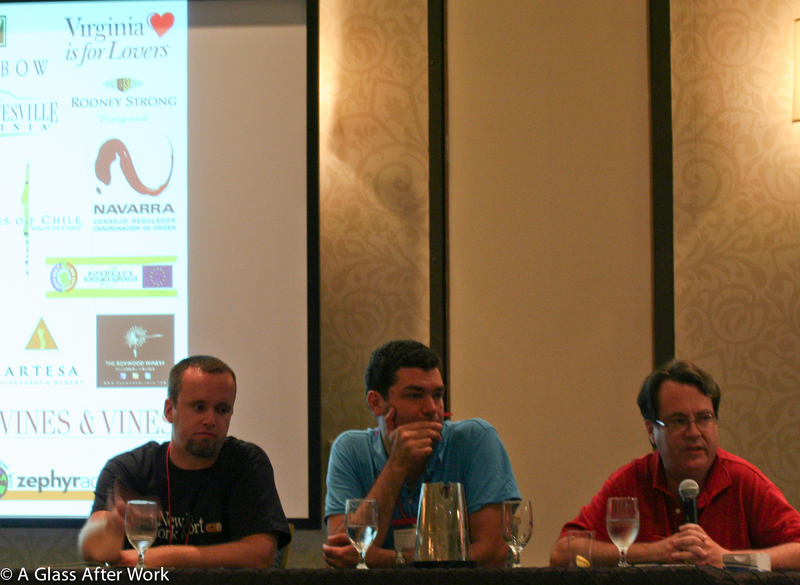 The second group of breakout sessions at the Wine Bloggers’ Conference 2011 was not as interesting to me, but since I’m a fan of the bloggers that were lined up for the “Drinking Local” panel, I decided to attend that session. The panelists were Dave McIntyre, who is a blogger, freelance wine writer for The Washington Post, and founding member of DrinkLocalWine.com; Lenn Thompson, who is the founder of New York Cork Report; and Rémy Charest, who is the blogger behind The Wine Case in Canada. My friend and fellow blogger, Frank Morgan, who writes Drink What YOU Like, moderated the panel. Many of you may recall that I spent all of October 2010 drinking Virginia wines in celebration of Virginia Wine Month. Virginia is actually in the top five wine regions that I blog about because I do like the fact that I can get good quality wines and support the burgeoning local wine industry. With all of that in mind, it’s probably not surprising that was intrigued by drinking local. However, I left the conference questioning the idea and the motivation behind the movement. In fact, as the discussion at WBC unfolded, I became more and more disillusioned. I hate to say it, but ultimately, I felt like the drink local movement has less to do with drinking locally produced wine and more to do with supporting smaller wineries over larger producers and agribusinesses and supporting wineries that are located anywhere but in California, Oregon, and Washington. If that is the case, than the “Drink Local” movement is something that I can’t get fully behind. I think the larger vineyards and wineries have as much a role to play in the wine drinking experience as the smaller producers. In fact, without some of the work the larger producers do, it would be even more difficult for the smaller producers to make their own way in the wine world. I also think that California, Oregon, and Washington are paving the way for worldwide recognition of what American wines have to offer. To ignore that work simply because it is made by a larger producer or because the wine isn’t made in “The Other 46” seems like a trend that unnecessarily spurns good wine. Dave: A story that is only just beginning to be told. 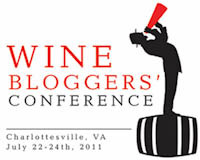 For some reason, Virginia has a very active #vawine blogging community that blogs about the wines in the area. And, don’t forget, Oct 9-1 is Regional Wine Week. Lenn: Community…I appreciate and like knowing the person that is growing the grapes that are going into my wine. Many people are willing to pay the $8.99 for the heirloom tomato from the farmers market down the street, but that doesn’t seem to translate into wine. A very touchy subject…price. Would you pay more to drink local? Is local wine overpriced? Dave: To begin with, you need to trick people. You have to have them taste the wines blind. Boxwood’s Topiary is $25, but if you put it up against a California or French Merlot, it would hold its own. We need to do that comparison to hit people over their heads. My Thoughts: Put simply…no, but I don’t want to pay more for produce or any other goods just because they’re local either. If goods are the same quality and the same price, I will almost always buy the local product. If it is more expensive but better quality, I will certainly buy the local product. But, I wouldn’t pay more for the same or lower quality goods just because they’re local. Local-vore vs. local-pour…how to we address the disconnect between drink local and eat local? Dave: As writers, keep beating them over the head about it. As winemakers, visit the restaurants. As far as VA wines getting onto DC restaurant wine lists…well, Lee had trouble crossing the Potomac, too. In general, though, the Virginia government is very supportive, so the Governor has put a lot of money into it. Maryland’s government, on the other hand, is not as supportive, so it’s harder. Rémy: Distribution is a problem. Some of the best wines are 150 cases, so it’s a problem. Lenn: At Long Island restaurants, you often don’t find a LI wine, but you almost always find at least one LI beer on tap. The challenge is getting the locals to challenge a restaurant to have the wine. Most people aren’t comfortable challenging the restaurant because they think the restaurant knows what goes best with the food. Not having local wines on the wine list makes me question whether the restaurant really cares about local food or if they’re doing it because it’s trendy right now. My thoughts: Hardy Wallace from Dirty South Wines loudly rejected most of what the panelists had to say about why local wines are not catching on with the same zeal as local foods. In fact, he bluntly said it was a quality issue, and I have to say, for the most part, I agree with Hardy. If you make good wine, people will buy it. If you make plonk, well, no amount of winemaker visits, increased production, or local-pour trends will help. It sounds like local wineries have a marketing problem, or maybe it’s a money problem, because it sounds like it takes a long time for a region to get the marketing off the ground. Is there any region that has done this particularly well? Frank: From a Virginia perspective, media, restaurant, & food service folks take VA winery trips with the VA First Lady. The sommeliers and the restaurant folks that join her often are visiting a VA winery for the first time. Lenn: The VA wine board is the benchmark for what regional wine industries should do. Dave: Someone who came 25 years ago and tasted the first Virginia vintages found that they weren’t good. Those people may be turned off to all local wines, so they need to be reintroduced. Rémy: A tourism component is essential. How you get someone to go somewhere when there is no reputation is a huge amount of work. Plus, wine regions need to make wines that correspond to what the region can make locally. Don’t try to make something else, identify what is the region’s character. My thoughts: I do think this is where quality plays a significant role. To Rémy’s point, the only way to get quality is to focus on the grapes that the region does well. Once the quality is there, having the financial and political support seems to be essential to raising awareness about the wine region, but without the quality, there is only so much marketing that can be done to increase visibility. Direct shipping plays a big role in the drink local problems because traveling with wine is difficult. Many states have laws that make shipping alcohol very difficult. My thoughts: REALLY?!?! This point was raised numerous times during the panel, but I think it’s funny that direct shipping would play a big role in the drinking local movement. If you were drinking local wine, wouldn’t you be able to avoid the shipping problems? Question of the Day: What do you think of the “Drink Local” movement? Would you pay more for local wine? I just found your blog so sorry to comment so long after the actual post, but I think they have a semantic problem. They aren’t talking about drinking local they are talking about craft production (small scale wineries) and why it should be supported where ever it occurs. As for Virginia wines, while I am a huge supporter, I think the state will always have issues in the larger market because the variability of the climate/weather makes the wines so different from year to year. If I love a Viogner or Cab Franc from a winery one year, I better buy it while I can because the next year it is often completely different due to the changes in temperature and rainfall and they have sole out of the 100 or so cases they released the year before. While this is true of other areas it is a more stark difference in Virginia. I think it is important to give the little guys a chance and if they have a quality product then support them but it is all about balance.